The Edwardian architect Sir Edwin Lutyens worked at Overstrand, designing Overstrand Hall for Charles William Mills, (2nd Baron Hillingdon), The Pleasaunce for Cyril Flower, (1st Baron Battersea) and the Methodist Church. 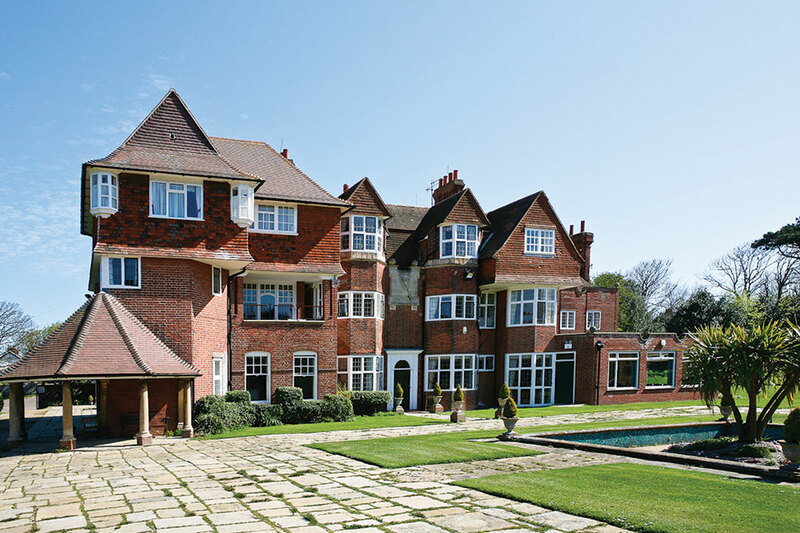 His influence can also be seen in other Overstrand houses of that period and he remains today one of England’s most respected and famous architects. Born 29th March 1869, Edwin Lutyens started work as an architect at the age of twenty, and he worked persistently, with very little time for other interests. The Pleasaunce was designed for Lord and Lady Battersea in 1888 at a cost of £70,000. Graham Wallas and Sidney and Beatrice Webb, spent a working holiday in Overstrand. The Webbs stayed with Lord and Lady Battersea at The Pleasaunce. Lord Battersea was Chairman of Overstrand Parish Council from 1904 up until his death on 27 November 1907. He is buried in St. Martin’s churchyard. 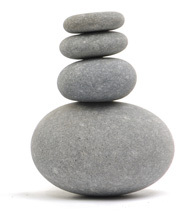 On one side of his tombstone are Walter Savage Landor’s lines: “Nature I loved and next to nature, Art. I warmed both hands before the fire of life, It sinks, and I am ready to depart”. Lady Battersea died in 1931 and is buried in the Jewish Cemetery, Willesden, London. It was reported that the sale of the contents of The Pleasaunce, took twelve days; three days for the sale of books, two for the paintings and seven days for the remainder of the items. The estate was then divided into parcels and individual building plots and auctioned in 1936 by Arnold and Son, Estate Agents and Auctioneers of Norwich. The Pleasaunce was sold separately to Lancashire and Cheshire Endeavour Holiday Homes Limited. The Methodist Chapel a Grade II Listed Building was built in 1898 on land given by Lord and Lady Battersea. It is a highly unusual building designed by Edward Lutyens, and it is suggested by Pevsner that the design is reminiscent of Lutyens’s later work in the crypt of Liverpool Catholic Cathedral. “The main doorway at the eastern end is awesome in its gravitas on such a small building. But the most curious feature is the set of buttresses which run from beneath the clerestory and support it out on the outer walls – as Pevsner says, it is an aggressive functionality”. It seems extraordinary now that this building was designed and built in the 19th Century, and with hindsight we can see that this was one of East Anglia’s first tastes of the Modernism which was an inevitable descendant of Pugin’s 1840s emphasis on the functionality of architecture, and which would be, by the 1930s, in the ascendant everywhere in the world. The second Baron Hillingdon, commissioned Edwin Lutyens to design a summerhouse for him in Overstrand, the work commenced on Overstrand Hall in 1899 and was completed by 1901. During the Great War the Dowager Lady Hillingdon allowed Overstrand Hall to be used as an Auxiliary Military Hospital, for Officers. The Hospital commandant was Lady Bridget Keppel, Lady Hillingdon’s sister. 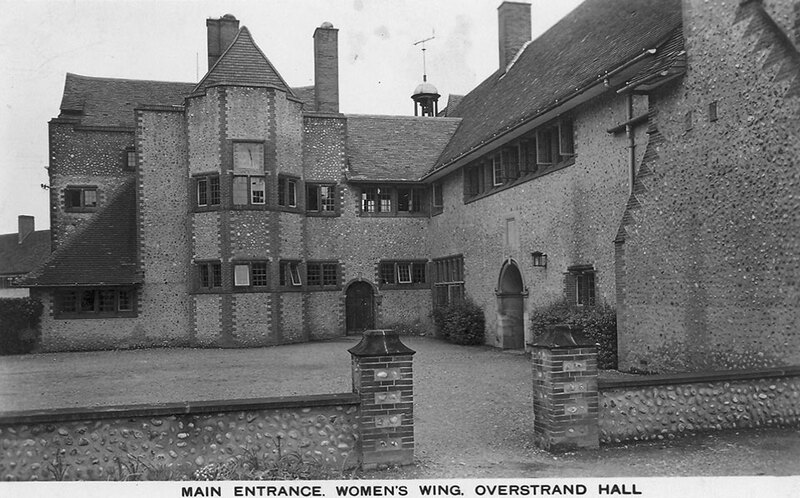 According to Major Herbert Dent MBE who was in charge of all local Auxiliary Military Hospitals, Overstrand was the most luxurious of them all, but was closed in under a year, being considered too dangerous, due to the possibility of raids. Lord Hillingdon’s son sold the property in 1932 to the Leicester and County Convalescent Home they in turn sold it in 1991. It is now a Kingswood Educational Activity and Leisure Centre.